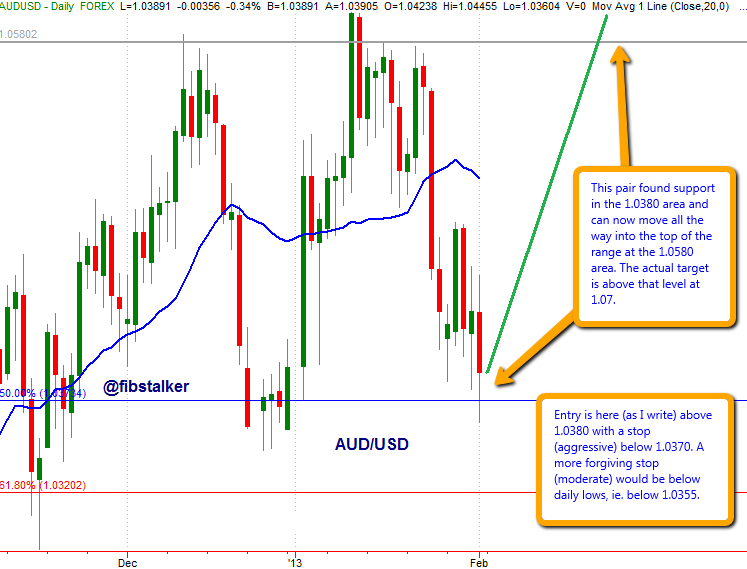 please find in the following an update for the AUD/USD major pair. 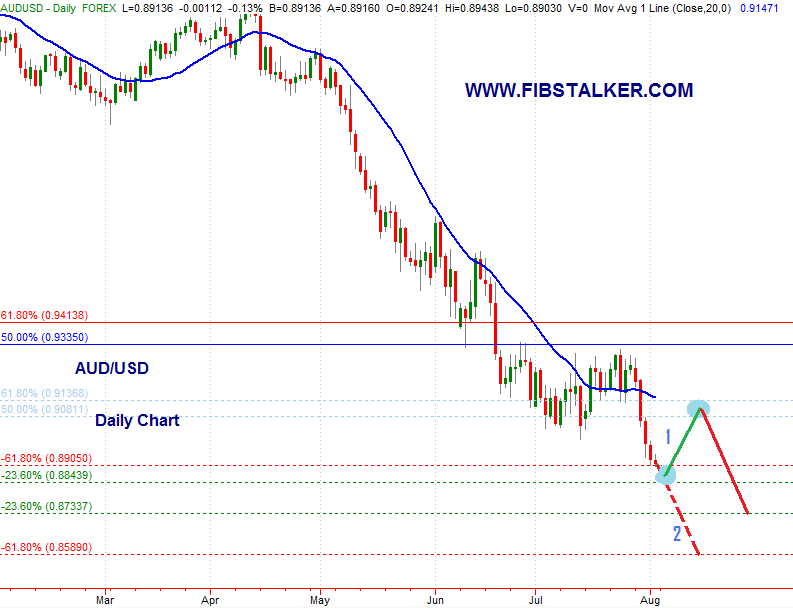 In the previous review for AUD/USD (July 30th 2013) I had indicated only one scenario after the completion of the move lower. That move is now completed and price touched the 0.8910 level, as anticipated. Scenario 2. Further weakness and a continuation lower into the 0.8595 area before a potential bounce. In the previous review for AUD/USD (July 26th 2013) I had indicated the 91.20 as the line in the sand where the correction into the 0.95 area would have been aborted. Yesterday that level was pierced on the downside indicating renewed weakness for the Aussie. In my opinion the larger target for the current move lower is at 0.85 (please watch the coming weekly review). It looks like bears front ran the 0.9330 area of resistance having a target in the 0.8840 area. This are is close to the 2nd target of the current daily extension short in this pair, coming around the 0.8910 area. Our model of Program Trading suggests some profit taking in the 0.8840 to 0.8910 area. After and if that happens, we cannot exclude a retrace (profit taking of shorts) into the next area of resistance on the daily chart at the 0.9080 area. If bears participate in that area we could see new lows into the 0.8730 area. this morning I worked on a trading plan for the Aussie, i.e. the Australian Dollar versus the US Dollar and I am sharing it with you in this post. I think there is an opportunity evolving right now in this forex pair. Entry is here (as I prepare the chart and record the video) above 1.0380 with a stop (aggressive) below 1.0370. A more forgiving stop (moderate) would be below daily lows, ie. below 1.0355. A good long opportunity is unfolding here. Please let me have your thoughts. Thank you. 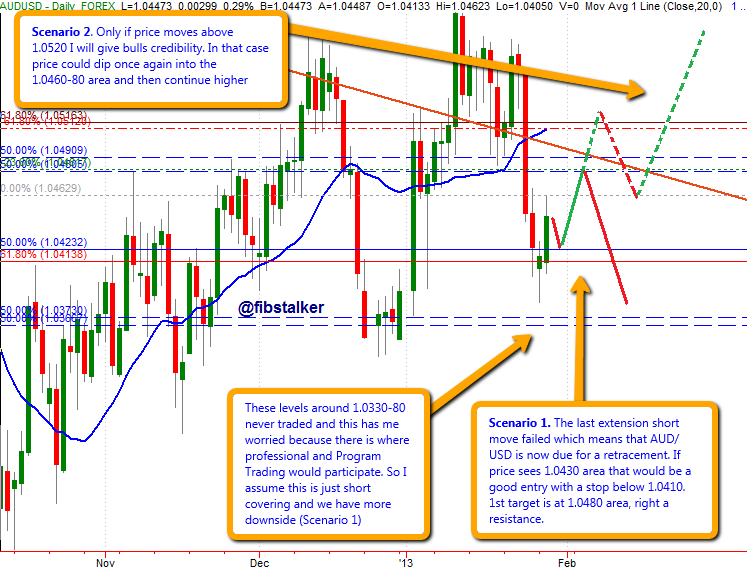 this morning I worked on a trading plan for the Aussie, i.e. the Australian Dollar versus the US Dollar and I am sharing it with you in this post. The forex pair could have interrupted its sequence of measured moves lower, so I believe it’s due for a larger retracement higher. However the levels around 1.0330-80 (see picture below) never traded and this has me worried because there is where professionals and Program Trading would participate on the long side. Scenario 1. If price sees 1.0430 area that would be a good entry with a stop below 1.0410. 1st target is at 1.0480 area, right a resistance. However, it is better to wait for confirmation before getting involved.